Why is Deep Equity Successful? 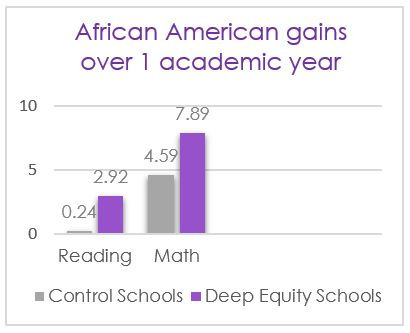 As we look at the implementation of Deep Equity we wonder what the successes might be. We immediately notice the impact of our work. There is a significant shift in the tone and the depth of adult conversations. We observe more trust and more honesty when issues of diversity are being brought up. Staff members are willing to discuss and tackle more difficult topics about race, gender, culture, and sexuality. Also, a clearer leadership focus on equity can be observed. As we move into our first year of Deep Equity work, we observe an increase sense of belongingness/connectedness. The relationships between students and adults grow and become more positive too. Students also feel empowered to speak their truth a lot more often. In the second year of our work we observe how The 7 Principals of Culturally Responsive Teaching are embedded and reflected in the classroom. We further support the staff engaged in cultural competence work. We firmly believe the “Leading for Equity” guides all decisions and that every teacher should add it to their toolbox. Going into our third year of practice and beyond, we notice a significant reduction in educational disparities, discipline referrals, and achievement levels. Graduation and college attendance rates also improve substantially for those students that go through a school environment that focuses on equity. The Deep Equity work can help you move the dial for your school or district. 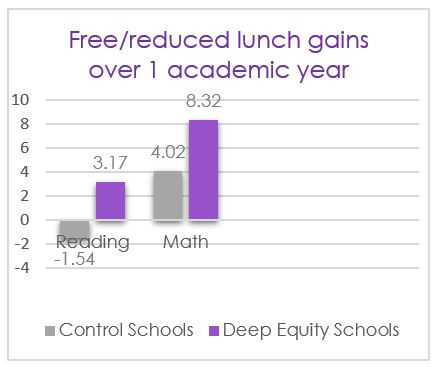 These results are from a case study that compared student achievement between schools in the same district that engaged in Deep Equity and those that did not. Jefferson County Public Schools (JCPS) is one of the largest, most diverse districts in the United States, serving 100,600 students from early childhood to 12th grade. Over 120 different languages are represented by the student body, 51% are students of color, 64% of students receive free/reduced lunch, and over 6,000 JCPS students are considered homeless. Check out the full JCPS case study to see how Deep Equity raised academic proficiency levels, decreased disruptive behavior, and started meaningful conversations between staff to inspire real change for their diverse population. What are others saying about Deep Equity? Dennis Carlson, superintendent of Anoka-Hennepin School District, in Minnesota, speaks about his district’s great need to address changing cultural and equity issues. Educators and students from across the country talk about why they feel the Deep Equity program is important, worthwhile work.